Lock in a great price for QT Wellington - rated 9 by recent guests. Breakfast was very good and located in the Hippopotamus Restaurant. The fine dining on Friday night we had we were just blown away with it. It was out of this world!! The lap pool spa and gym were great. The in-room coffee making facilities were excellent. Started staying at The Museum before it was moved, thought it would be nice to celebrate our 48th wedding anniversary there. Convenient location, very pleasant surroundings. Location and room was great. Breakfast was nice but staff overloaded and dining room was not under control. Second time we’ve stayed here & are booked to return. Great location, fabulous rooms, comfortable bed, very clean. Breakfast was great. Our room had a balcony & looked out to the marina & Te Papa. Cool lounge/bar. Would certainly recommend staying there. We visited on the occasion of our 33rd wedding anniversary and the hotel staff provided us with some lovely touches to ensure the stay was awesome. This included the dinner in the Hippopotomus restaurant where the food was first class. The Hotel has surpurb artworks and sculptures all throughout the building making is interesting no matter where you are. 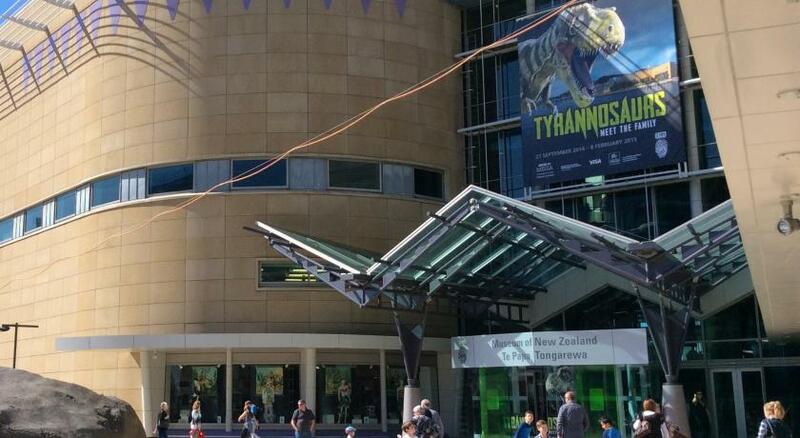 One of our top picks in Wellington.Located on Wellington's sparkling waterfront, QT Wellington is situated opposite Te Papa. This design hotel boasts a large collection of contemporary New Zealand art. It features a fitness centre and an indoor heated swimming pool. Each of the elegant rooms and spacious suites at QT Wellington includes satellite TV, private bathroom with hairdryer and ironing facilities. Some rooms have harbour views and a kitchenette. Hippopotamus Restaurant & Bar serves French-influenced cuisine and enjoys stunning views of Wellington's beautiful harbour. Hot Sauce, the property's new Asian Eating House and Bar, is open daily in the evenings. 24-hour room service is available. Leisure facilities include a spa pool, sauna, plus a luxury day spa and hair design studio. 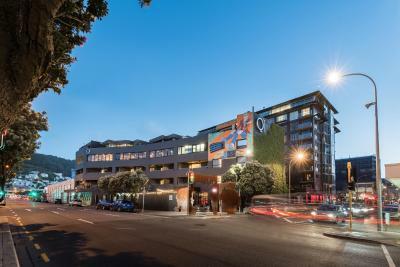 QT Wellington is a 3-minute walk from Courtenay Place, Waitangi Park and Oriental Parade beach. Free internet access is available in the lobby. QT Wellington has been welcoming Booking.com guests since 24 Sept 2009. When would you like to stay at QT Wellington? This spacious king room boasts all of the signature QT comfort and quirk along with luxury perks including a private balcony looking out over the stunning Wellington harbour. Rooms include an en suite bathroom. Rooms with a bath are available upon request. Private parking is possible on site (reservation is needed) and costs NZD 35 per day. Spacious and stylish, this QT Deluxe King room includes air-conditioning. Guests can relax with a 42-inch LCD TV, tea & coffee making facilities. There is an en suite bathroom with a shower. Guests receive full access to the pool, fitness centre and hot tub. Spacious and stylish, this QT Superior King room boasts the signature QT comfort and quirk throughout. The air-conditioned room features a flat-screen TV, tea and coffee making facilities and an en suite bathroom, with bath on request. The QT Gallery rooms feature unique artwork created by some of New Zealand’s most dynamic artists. The rooms may feature either a bedhead mural, a quirky sculpture or custom-made wallpaper. Each room boasts its own art personality and plush QT luxuries. A bath is available upon request from the property. Please note requests for specific art rooms are subject to availability upon booking. The QT Harbour View Gallery rooms feature unique artwork created by some of New Zealand’s most dynamic artists. The rooms may feature either a bedhead mural, a quirky sculpture or custom-made wallpaper as well as Wellington Harbour views from the window. Each room boasts its own art personality and plush QT luxuries. A bath and a balcony are both available, upon request from the property. House rules QT Wellington takes special requests - add in the next step! A damage deposit of NZD300 is required upon arrival, which is about GBP153.97. This deposit is fully refundable during check-out as long as there has been no damage to the property. QT Wellington accepts these cards and reserves the right to temporarily hold an amount prior to arrival. A damage deposit of NZD 300 is required on arrival. That's about 153.97GBP. This will be collected as a cash payment. You should be reimbursed on check-out. Your deposit will be refunded in full in cash, subject to an inspection of the property. Please inform QT Wellington in advance of your expected arrival time. You can use the Special Requests box when booking, or contact the property directly with the contact details provided in your confirmation. The room that I had requested, (a twin room) was a king that had not been split to become twin beds, nor had the next room that they shifted us to. The third time they got it right. However we left while they were remaking the beds and the hotel did apologise for the inconvenience. Few long wait times to be served fro check in, bar and the next morning for breakfast. The lovely spa is about 2 degrees too hot to be comfortable. The corridors need sprucing up. The room make up was not great as the mini bar was not replenished and only the bed was made none of the cushions put back on the bed ect. Some of the hot breakfast items were a bit cool, that was all. Valet parking was appalling.we waited 30 minutes to get our car. Staff had no idea where it was and there was no system. This was a really disappointing end to an otherwise good visit. Staff were just hopeless.